Friedl Holzer-Kjellberg who originally came to Finland from Austria was employed by the Arabia factory in 1924. She became interested in the Chinese "rice porcelain" dating from the 18th century Chien Lung period while visiting the museums of her native country. 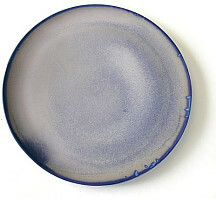 As a result of her ten years of experimentation she managed to solve the secret of the "rice porcelain" technique. Friedl Kjellberg worked for Arabia a total of 46 years. Represented: Victoria & Albert Museum London, Design Museum Helsinki, Rohska Museum, Goteborg, museums of Faenza, Amsterdam, Trondheim. Exhibitions: Kjellberg has represented Finland at numerous domestic and foreign design exhibitions, and rewarded numerous prizes and citations both home and abroad, for ex. Bryssel 1935 (Gold Medal), Milano Triennal 1954 (Gold Medal), Cannes 1955 (Gold Medal) and 1962 the Pro Finlandia medal for artistic achievements.